Disability Blog Carnival #13 is UP NOW! Thanks to all who participated this round. Disability Blog Carnival #14 is scheduled for May 10 at The Gimp Parade--host Blue has set the theme as "Firsts," however you want to run with that concept. Submit your links or links from other blogs at the blogcarnival website, or leave comments here, or at the Gimp Parade, by Monday May 7 for consideration. 2 May 2007: The latest installment in the disTHIS! Film Series showcases local New York City filmmakers on disability topics. They'll be screening and discussing three documentaries (One Night Sit, We Also Dance, and Spit it Out) at the Firehouse that night; for more details check the disTHIS! website. The newly formed Disability Art and Culture Project merges disability studies with performance in its second annual festival. Disability Pride promotes the idea that people with disabilities deserve to be celebrated, their stories need to be told and their contributions to the community at large need to be recognized. The festival brings together dancers and performance artists for three days of film screenings, live performance and workshops to celebrate the work of regional artists and to provide the general public with an alternative view of the lives of people with disabilities. Check the website for more details about the program. It's all happening at the Central Lutheran Church, 1820 NE 21st Ave, Portland; price is $10 per evening (workshops free!). E-mail: kafia@prodigy.net or Call 503-522-5218 for more details and accommodations. They're also looking for volunteers to work at the festival. 21 July 2007: 4th Annual Disability Pride Parade: Disabled and Proud 2007 in Chicago IL. Individuals and groups intending to participate should register now at the website. The parade is part of a weekend of festivities, including an open mike poetry slam. 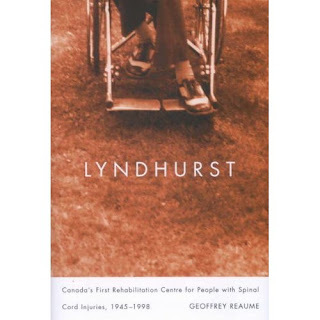 New book: Geoffrey Reaume, "Lyndhurst"
News in the inbox today about Canadian disability historian Geoffrey Reaume's new book, Lyndhurst: Canada's First Rehabilitation Centre for People with Spinal Cord Injuries, 1945-1998 (McGill-Queens University Press 2007). 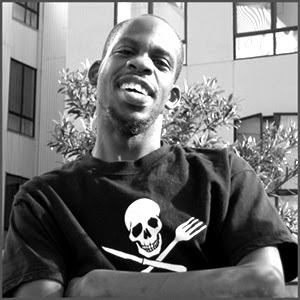 Reaume is an assistant professor at York University, where he teaches Mad People's History in the Critical Disability Studies MA program. He's one of the organizers of the Psychiatric Survivor Archives of Toronto. His previous book, Remembrance of Patients Past (Oxford University Press 2000), explores patient life at the Toronto Hospital for the Insane. Only recently have the voices of the disabled - the personal experiences of people with disabilities - been included in medical history. Lyndhurst marks an important contribution to disability and medical history by providing first-person accounts of patients, staff, and disability activists at Lyndhurst Lodge in Toronto in post-war Canada. Lyndhurst was the first facility in Canada to focus solely on people with spinal cord injuries, eventually also treating people with related disabilities, such as polio. Geoffrey Reaume details the changes in treatment of paraplegia and quadriplegia that allowed more people to survive and to return to the community, the evolution of social policies that emphasized greater inclusiveness in society for people with physical disabilities, and the role of disability activism in helping to advance these changes. Lyndhurst is the first Canadian history to trace these developments through the mid to late twentieth century. It is a timely reminder of the past role of government, the health care sector, and disability activists in shaping disability social policies. And, coming in the fall of 2008, the Canaday Center will collaborate with the Disability Studies program and the Public History Institute in the University of Toledo history department to mount an exhibit on the history of disability in northwest Ohio, with a nice grant from the university's Program for Academic Excellence. There's word that an online virtual exhibit will complement the in-person version, too, so we may all get a chance to visit this worthy project. 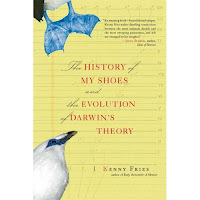 New book: Kenny Fries, "The History of My Shoes and the Evolution of Darwin's Theory"
Kenny Fries tells two stories: the development of the theory of 'survival of the fittest,' as articulated by Charles Darwin and Alfred Russel Wallace, and the history of his ever-changing, made-to-order, orthopedic shoes....Although only the 'fittest' may survive, Fries learns that adaptation and variation are critical to survival. What is deemed normal, or even perfect, are passing phases of the ever-changing embodiment of nature in our world. Kinda puts a whole new spin on going to the orthotist for a "fitting," eh? Irish artist Eva Sydney "Evie" Hone was born on this date in 1894, in Dublin. 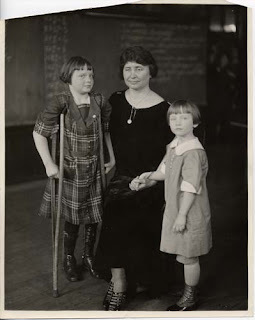 She became partly paralyzed at the age of 11 (some sources say it was polio, others say she fell while decorating her church for Easter--maybe both are true). Hone's family sent her with a governess on a trip through Europe, in search of effective treatments, so her teen years were spent in France, England, and Italy. Travel didn't result in a cure, but she did come to love art, and studied at the Westminster School of Art in London (where she met her companion Mainie Jellett (1897-1944), a fellow Irish artist), and later in Paris. It is said that she was drawn to modern art in part because the paralysis meant she was unable to hold a pencil or brush in traditional ways. Together, Hone and Jellett mounted one of the first exhibitions of abstract art in Ireland. In 1925, Hone entered an Anglican convent in Cornwall, but left the following year to resume painting. In the 1930s, she found herself drawn to religious art, especially to the design of stained glass. She joined a stained glass studio in 1933, and was considered an innovator in the medieval form. She converted to Catholicism in 1937, but created more than a hundred windows for both Catholic and Protestant spaces in Ireland and England, as well as designing commissioned windows on secular themes, for universities and government buildings. She died while attending mass, at the age of 60. In 2005, the National Gallery of Ireland marked the 50th anniversary of her death with a special exhibition and lecture series about her work. Congratulations to Tsuchida and Soejima! The 111th Boston Marathon (the world's oldest annual marathon--they like to point that out) almost didn't run on Monday--Boston was in the path of a big nor'easter that dumped a lot of snow and rain on the whole region. But organizers decided at 4am race day that it should go forward, and it did. But wait, there's more. 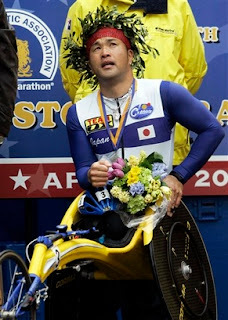 The Boston Marathon has several divisions for disabled athletes. In the visually-impaired division, Americans Adrian Broca and Ivonne Mosquera had the top times. 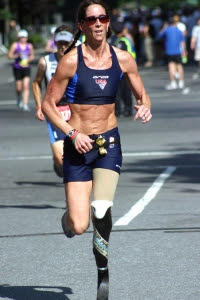 In the mobility-impaired division (in which competitors usually ambulate with prostheses, crutches, or braces), Paul Martin and Amy Palmiero-Winters (pictured at right, not at the Monday race) placed first and second. Congratulations to all the athletes who participated! Blogging against Disablism Day returns! Renowned jazz pianist and composer Keiko Matsui (pictured at right), recognized as a Japanese national treasure, will perform with the Asia America Symphony Orchestra on Saturday, June 9 at 8 p.m. under the baton of Music Director and Conductor David Benoit. The concert will take place at the George and Sakaye Aratani Japan America Theatre at the Japanese American Cultural and Community Center, 244 S. San Pedro St. in the Little Tokyo area near downtown Los Angeles. With generous funding from Pioneer Electronics (USA) Inc., the concert will feature the U.S. debut of Pioneer’s listening technology for the deaf and listening impaired. Pioneer has invited students from local universities and college campuses that are well-known for their deaf studies programs, as well as members of local advocacy groups, such as the OC Deaf Equal Access Foundation (OC DEAF) and the Greater Los Angeles Agency on Deafness (GLAD), to attend the concert free of charge to experience the music of Matsui and the Asia America Symphony Orchestra using this innovative technology. Known as “Listening Through the Body” in Japan, Pioneer’s technology has been tested successfully and is used at leading Tokyo concert halls. It features a vibrating seat and speakers at ear level that allow users to feel the rhythms and vibrations of the musical performance. The system can be used with or without a hearing aid. Japanese concertgoers who have used the Pioneer technology—including those who lost their hearing in adulthood—say it allows them to enjoy music. Employees at Pioneer’s headquarters in Tokyo, where concerts for the deaf and hard of hearing are held monthly, report that users of the listening system are often overcome with emotion when experiencing musical performances for the first time. For this reason, Pioneer’s dedicated and passionate sound engineers have developed and refined the listening system as a labor of love. 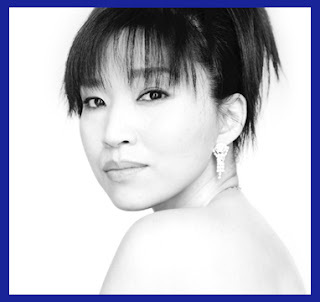 Born in Tokyo and known for her smooth jazz compositions and piano artistry, Keiko Matsui has released more than twenty CDs with her newest, entitled Moyo (Heart and Soul), released in April 2007 by Shout Factory. The June 9 concert will also feature works by Ravel, Copland and others. Tickets ($25-$75) are available at the symphony's website or by calling 310-377-8977. Pioneer Electronics (USA) Inc. is headquartered in Long Beach, CA. Locate services for children within debates about institutional and community care (framed by the adult experience) over a much longer time-frame. Extend analysis to a range of physical and sensory disabilities alongside, and in comparison to, provision for children with mental health problems and/or learning difficulties. Contrast evolving institutional and community-based services for children with disabilities with statutory and voluntary sector provision for children in care because of family breakdown and/or childhood delinquency. Re-examine and integrate the now extensive literature on infanticide, child abuse and "mercy" killings, in relation to childhood disability issues. Evaluate midwifery and obstetric services, including the development of pre-natal screening and special care for premature babies. Assess the role the medical profession played in the diagnosis of childhood disability and the control of specialist services. Here special attention will be paid to the relationship between knowledge and practice. Develop an understanding of the relationship between knowledge and practice for nurses, physiotherapists, occupational therapists and speech therapists. Emphasise the role community-based services play in leading people into, as well as out of, residential care. Draw together ideas about children in need to link efforts to maximise the opportunities available to children disadvantaged by poverty and/or disability, through an evaluation of the SureStart scheme. Acknowledge the contribution of the voluntary sector and self-help initiatives. Involve researchers and practitioners from a range of disciplines. Develop an international dimension to this research by inviting participants from abroad. Develop opportunities for the publication of selected conference papers. All inquiries about the conference should be addressed to Pamela Dale at the Center for Medical History. Disability Blog Carnival #12 is up NOW! Tokah's posted the latest edition of the Disability Blog Carnival at From Where I'm Sitting--the theme is "Disability and Culture," which Tokah threads through groups of posts about Crip Culture, Assistive Technology, Accessibility, Screen and Stage, Quality of Life, Blame, and Politics--that's a lot of coverage, and a lot of links; something for everyone, surely. 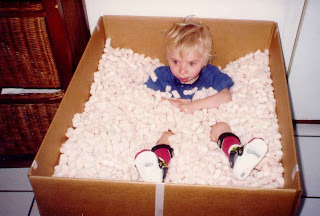 Disability Blog Carnival #13 will be hosted by Amanda at ballastexistenz on April 26. Submit using the blogcarnival.com form, or leave a comment here with your links, if that works better. Does hosting look fun? It is--and I'm looking for hosts for May and into the summer now. Leave a comment here if you're interested. We've got several repeat volunteers willing, but new hosts are always cool too. Torrance, California, comes in for no end of mockery. It's called "Borrance" by some, and music fans may remember director Spike Jonze's ironic "This is for Torrance!" shout-out from the podium at the MTV Music Awards a few years back. Torrance is where Quentin Tarantino grew up. A lot of high-school scenes in movies and television are filmed in Torrance, for some reason. 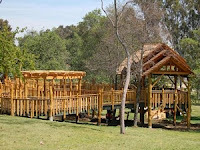 The treehouse decking is made of stamped, sustainably-harvested South American Ipe wood, and the oak posts were recovered and repurposed from fire-damaged forests in southern Oregon and trees damaged by grazing horses. The wooden branches in the arbor are recycled; they would normally have been chipped or thrown away in the logging process. The helical pier foundations are among the most environmentally sound methods for placing posts near living trees. The design and placement of the treehouse will enable the adjacent trees to grow unimpeded. There are many photos of the 2500-square-foot treehouse online here (including the photo above). The on-the-scene report: it's still in great condition after a year's use. Accessibility isn't just accomplished with the no-steps, no-ladders entry--there are also wide smooth walkways throughout, and sturdy railings. It's "just" a treehouse--no built-in toys or anything--but it's big, and most of the kids who play there seem to get a kick out of chasing each other around the structure. The wider "rooms" would be fun places for a group of children to sit together for a circle time. I liked that there were parts that were very shady, and parts that were sunny--nice variety there. It's not especially close to any parking, though the parking area for the park itself is large and otherwise accessible. "Convalescence and California: The Civil War Comes West"
The Department of History at CSU Northridge will hold the annual W.P. Whitsett Lecture in California and Western history on Friday, April 20th at 8 p.m. in the Grand Salon of the University Student Union at CSU Northridge. Professor William Deverell, Director of the Huntington-USC Institute on California and the West and Professor of History at the University of Southern California, will lecture on "Convalescence and California: The Civil War Comes West". The public is invited. The lecture will be followed by a reception. Since seating is limited, please call the Department of History at 818-677-3566 to make a reservation and to obtain information on parking. Professor Deverell has a forthcoming study on The Redemptive West: Convalescence, Healing, and the Post-Civil War Nation. His Whitsett lecture will explore several themes from this study, most notably the extent to which soldiers and their families, their lives shattered by the war, looked to California for hope and rejuvenation, just as the nation looked to the far West for national redemption. Happy 42nd birthday to English artist Alison Lapper (pictured at right), born on this date in 1965. She's perhaps best known as the subject of the Marc Quinn statue, "Alison Lapper Pregnant," a larger-than-life marble which has stood on Trafalgar Square's "Fourth Plinth" since 2005. This month, it's scheduled to be taken down, and replaced with another work of public art (so those of us who never got to London to see it are out of luck). The statue was featured on Ouch! podcast #4--how do you feature a statue on an audio program? I'll say only that a megaphone was possibly involved. There's an edited excerpt from Lapper's autobiography, My Life in My Hands (Simon and Schuster 2005), online here, concentrating on her childhood in a residential hospital, and her young adult years, seeking independence, education, a career, love, the usual stuff. Noted Tamil performer J. Kutty has died, after a fall at a hotel in Paramakudi. Kutty, born Philip Breet Mankoshy, was just 23 years old. 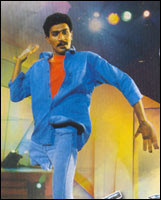 He is best known for his role in "Dancer," a 2005 Tamil film about a one-legged dancer, based in part on his personal story. Kutty lost his own right leg in a motorcycle accident in 1998. He was in Paramakudi to perform at a temple festival with an arts ensemble. The very defect of sight, which proved an insuperable obstacle in the career which I had chalked out for myself, has peculiarly fitted me for a new and more extended sphere of usefulness. Today marks the birthday of British doctor Thomas Rhodes Armitage, born on this date in 1824. He is best remembered as founder of the Royal National Institute of the Blind (RNIB). Armitage trained as a doctor, and worked in medicine for years, including a stint in Turkey during the Crimean War. He married in 1860 and had two sons and a daughter. 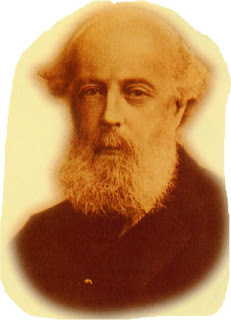 Armitage (shown above left, in a sepia-toned portrait found here) left his medical practice in 1866, when he could no longer see well enough to read printed text. From then, he became interested in the various possible systems of raised type. As founder of the "British and Foreign Society for Improving the Embossed Literature of the Blind," he was among those who popularized Louis Braille's six-dot system as the standard for producing literature for blind readers. Armitage was also concerned with employment for young blind men, and promoted vocational training in such fields as piano tuning to improve their chances of finding work. He raised funds to open the Royal Normal College for the Blind in 1872. His books included The Education and Employment of the Blind (1871, 1886) and The Condition of the Blind in Great Britain and Ireland (1878). ...the youngest Queen had only half-a-son—and that was what they called him at once,—just half-a-son, nothing more: he had one eye, one ear, one arm, one leg; in fact, looked at sideways, he was as handsome a young prince as you would wish to see, but frontways it was as plain as a pikestaff that he was only half-a-prince. Still he throve and grew strong, so that when his brothers went out shooting he begged to be allowed to go out also. This prince uses his unusual body to become a hero against all expectations: for example, he can slip through fences that his brothers cannot (his magic power over rope also comes in handy). His brothers push him in a well, but he's small enough to hide well and overhear a serpent and pigeon discussing their own magic powers. In the end, he wins the hand of a beautiful princess in marriage, and his mocking, jealous brothers are all eaten by a demon.